The power of a mindfulness practice lies in the space we cultivate between our thoughts/actions and our being. This space allows us to examine our deeper truths, our bigger why so we can choose our thoughts and actions purposefully. This can happen on an individual level for each person who chooses to practice mindful awareness and it is happening on a larger scale in our nation and our world. We are getting the opportunity to become aware of what has been unconscious within ourselves and within our country. We can only begin to address these problems on an individual level. We have to start with ourselves because no matter how much we try we can’t change other people. We have no power over other people, only ourselves. I hope I am brave enough to take every opportunity to look within and uncover another truth that I wasn’t aware existed. Awareness brings an opening to find places within me that need light in order to find greater understanding. If I choose to stay in the darkness, I lose out on understanding. I lose out on connection and enriching my life with people different than myself. Awareness means I am ready to step up my game and grow. 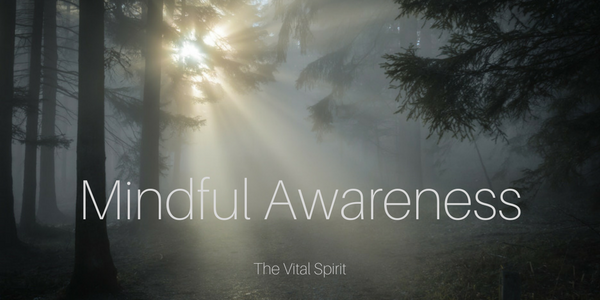 Mindful awareness is an opportunity to become more closely aligned with our divinity. Each awareness is a gift. The choice to unwrap it, to not be afraid of the sometimes unattractive wrapper, holds incredible power. For beneath our wounds, we are all glorious, we are each a divine child of the Universe.